I'm a professional Software developer focusing on Virtual Reality, Mixed Reality and immersive media. 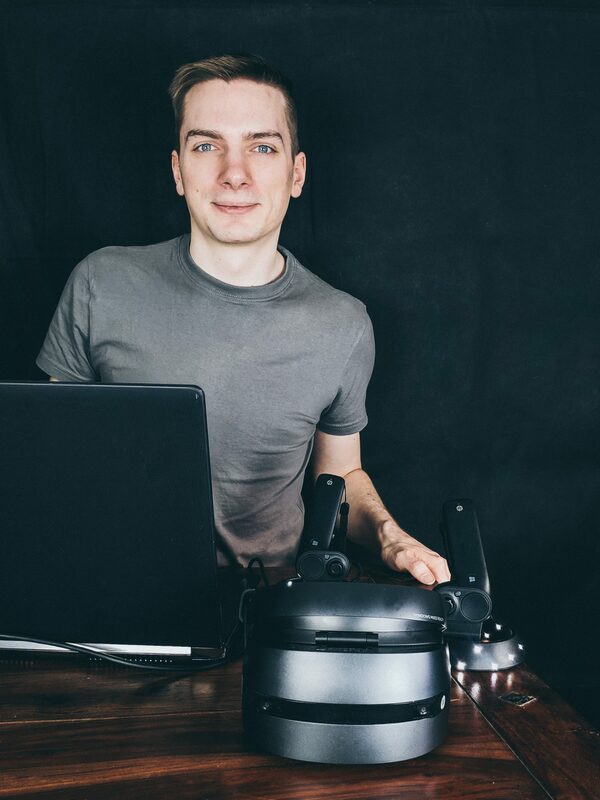 Starting with the new Virtual Reality revolution, caused by the Oculus Rift Kickstarter camapign in 2012, I started to develop Software specially designed for Virtual Reality and immersive input devices. I have experience with building custom input devices and with all common XR-Headests. With my book "Developing Virtual Reality Games with Unity" everyone can learn how to develop their own VR games. It shows the basics of Unity and prgramming in C# but focuses on the special knowledge that you need to develop games and apps for Virtual Reality headsets. The book is written in germand and was published by HANSER. Since early 2014 I work with present4D on their Virtual Reality Suite, which allows everyone to easily create Virtual Tours and product presentations. Our tours can easily be created within a VR-Headset, so you instantly see what you get. What was just one of many ideas became a fulltime project with several developers working on it. Since 03/2018 I work as a fulltime leading developer at present4D Gmbh which has offices in Düsseldorf and Dortmund. Overview of selected projects: Feel free to contact me for more details, further projects or demos. A german VR blog I write since 2012. Every now and then I try myself at PixelArt. Interview in "Virtual Reality rettet die Welt"
V.R.C.S. (Virtual Reality Cover Shooter) is cover shooter code base for Unity3D, designed for Virtual Reality HMDs with room-scale tracking. This is a gameplay tech demo showing some of the gameplay mechanics that can be achieved using the current state of the code base (No coding needed). The example scene uses assets from Unitys Bootcamp demo, because the code base and the example scene will be released on Unitys Asset Store for free, once it reaches a stable version with room-scale capabilities. Parallel to the VR Cover Shoter Engine, i'm developing a game that is based on the VRCS code base. But unlike this tech demo, that game uses high quality assets to create a dark and intense atmosphere. Those assets are not used in the tech demo, because i don't want to release them for free. I currently don't have anything to share with the public about this project. At the moment i'm using an Oculus Rift DK2 and a Razer Hydra for prototyping. This setup only has limited tracking abilities, and the project will be updated as soon i get my hands on room-scale tracking hardware. Have you ever been on a mission to outer space with your 3 best friends? No? Well this is your chance! The V.R.S.A. is recruiting, join today for the adventure of your life! Your job is easy: You and your copilots will sit in front of an control panel for distinct functions of the space craft. Your job is to control those panels properly. Easy, right? The V.R.S.A. is always looking for new Marines to send them to areas of the universe where no human being has been before (You get paid once you are back in the V.R.S.A. Headquater). Obviously neither one of you has a clue what to do, i mean you haven't been to space before, right? Well no problem! The V.R.S.A. wouldn't let random guys fly to space in a multiple million dollar spacecraft without proper instructions. Every one of you gets detailed instructions from the command center. (Yay!) Unfortunately the communication in this area of space is a little tricky from time to time and every now and then commands get delivered to the wrong crew members.. (Ohhh) Our technicians are doing their best to fix it, but in the meantime that's no big problem: You are equipped with the most up to date Voice Chat Technology to sort this issue out. Good look Gentlemen! Fasten your seatbelt, grab your GearVR and take a trip to space! In SpaceMission - The MobileVR Coop Experience you can team up with up to three other players locally or online and take a trip to space. But be warned this mission can only be successful, if all of you are able to cooperate. This is an Old School Horror Survival Game in the style of the early Resident Evil and Silent Hill games. Everything started a few years back when i found this Pixelart on DevianArt. The game is based on the old Resident Evil Games for Playstation 1 and is specially influenced by the first game. To port the Resident Evil Gameplay to VR I had to work out lot's of game elements and new techniques. After some varying concepts, I locked the best one: The whole level is shown in a top down perspective in a very small scale. The camera does not move at (to avoid artificial movement), so this game makes heavy use of positional tracking. The Player has to lean forward and sideways, maybe even stand up, to get a good perspective of what’s happening. – As if the room is standing in a miniaturized version, right in front of him on a table. The game uses real time lighting and shadows to create a dark and tense atmosphere with great lights and shadows. A Oculus Rift DK2 Version of the Concept was shown at the Cologne Virtual Reality Meetup, which was received very well. Are you a Pinball Enthusiast but you can’t have your own Pinball table at home? Here is my solution to play Pinball in Virtual Reality! This prototype uses severeal haptic feedback techniques to deliver a very realistic experience. The shown protoype was build as part of a project for my university. For this early Prototype I modified a Phillips Virtual Pinball. Everything but the housing was replaced during build. In 2015 and 2016 this prototype was shown at several Virtual Reality Meetups within Europe and recieved a very positive response. I currently consider turnin the prototype in a product which migh be produced in a small series. This was not planned, as I went to Gamescom 2015 and more like a concidence after all. But the NVIDIA cameraman and obviously also the NVIDIA cutter thought that my extroverted and jumpy way of playing with the balloon was worthy to be shown in the Gamescom 2015 showreel. Spectators told me afterwards that this was not the NVIDIA cameraman, but a second one. If someone finds the footage of this cameraman, please contact me. He was gone after I finished my demo. Open your clip, edit it right on spot and share it with your friends in no time! Smooth Action-Cam Slowmo is an Android Video Editor, that allows that not only supports editing Footage with more than 30FPS it also comes with advaned interpolation techniques to create smooth slow motions. This app is designed for Action-Cam, Drone and Smartphone users who travel a lot, who can't wait to get home to edit their footage or who are simply looking for a fast and easy solution to create ultra slow motion videos without learning how to use a complex video editing software. I'm currently working on an advanced shrinking system, where movie files get replaced by short dummy movies which the game can actually load / play. This will additionally reduce the chance of getting stuck or experience crashes. Unfortunately I'm struggling with finding the correct encoding settings, so that the games accept the video files for each of the main video file types on the vita (mp4, usm, bik). So here this first release does not support this, yet. Together with present4D I developed the first Version of the Coastiality App for and together with MackMedia GmbH & CO. KG. I was the leading developer and also coordianted the development within present4D. The Coastiality App is available in english, german and french and lets you enjoy roller coasters from the Europa-Park and other parks on your smartphone, Google Cardboard and Samsung GearVR. We developed the inital version and the first updates, until, due to the success of the app, MackMedia decided to transfer the project to an internal development team. Feel the hardware, revive your memories! VR-PinCade is an imemrsive input device for games which simulate pinball or arcade machines. It is designed to deliver a very realistic experience let the player believe, that he's actually touching the simulated table. Unlike other pinball and arcade controllers, it not only offers a realistic shape and input methods (buttons, joysticks, plunger, nudge detection etc. )but combines multiple haptic feedback concepts to deliver a unique and life like experience, which is not comparable to the feedback from simple rumble motors. VR-PinCade works via Plug-And-Play with any existing and upcoming Pinball and Arcade game, that supports gamepads (e.g. Pinball Arcade, Pinball FX2, New Retro Arcade, all Emulators etc.). VR-PinCades Software is planned to be open source, so the controller can easily be customized and extended. The feedback hardware works without changes on the game itself. Development for VR PinCade started in 2015 with an pinball only prototype that recieved very positive feedback at several meetups around europe. It has now become the final project of my studies. I like the challenge of expressing things with so few pixels. This shows me and how I stepped into the Tuscany Demo back in 2012, with my DK1 and a Razer Hydra.